Happy Monday!! Thank you all for your sweet comments and kind words about baby #2. Drew and I read every single comment and we feel overwhelmed by your love and support, so thank you!!!! You might’ve seen on my Instagram and Snapchat (@rachparcell) that we decided to drive up to Washington for the Tulip Festival this past weekend! It was quite the drive (14 hours each way!!) but it was SO worth it. This is a look I wore out to dinner while we were there. This tee is beyond comfortable, especially with my growing belly. I’m all about cute and comfy these days! Have any of you been to the Tulip Festival?! Brought to you by Mindy Mae’s Market. Wasn’t it amazing?!?! I want to go every year now! Love those cute booties and your oversized tee! Great weekend look! Such a great casual outfit! Love the booties! Love the all white with the neutral accessories… very chic, Rach!! Thanks Amber!! Your blog is so cute! this look is incredible, so chic! 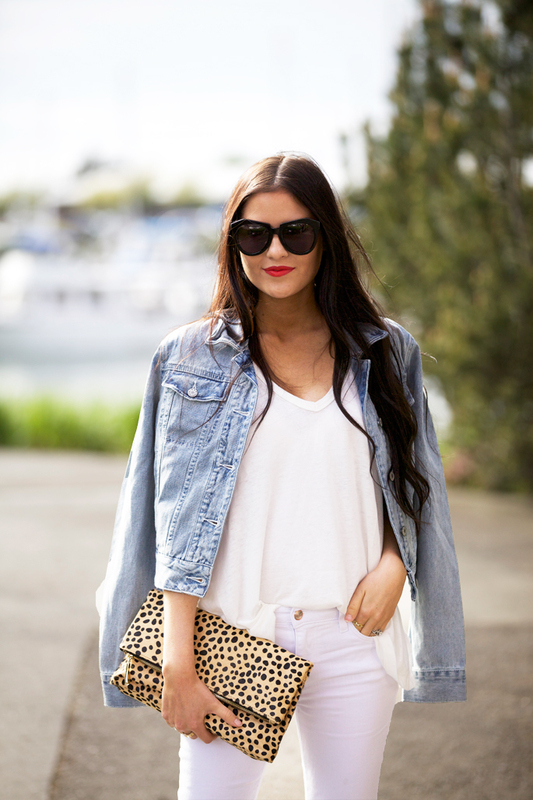 Love the all white look in contrast with the denim jacket! Loved your snaps, your trip looked like a blast! Happy you had a great time and can’t wait to read more about baby #2. I am totally kidding, I really do love this look (especially that gorgeous red lipstick color)! Congrats again on baby #2 and I can’t wait to see your pregnancy style this time around! Thanks Mariam!!! Maybe I’ll share my hair routine soon, thanks for the suggestion :) The Tulip Festival is in Washington and it’s just acres of gorgeous tulips!!! We had such a fun time. Denim jackets are a huge favourite of mine at this time of year too Rach! I love how you style yours, especially with the white jeans. The clutch is so pretty too! Thanks Grace :) And me too!!! I LOVE denim jackets and I really love this one! Thanks Cindy!! I loved the pleated leather skirt on your blog last week :) So cute! Absolutely loving those booties!! They’re stunning – great outfit!! What a beautiful spring outfit! Love your hair!! Such a cute look!! I’m so excited to see what your collection will look like! Thanks Jen!! They really are perfect for this season! So cute! You really know how to put a look together from head to toe! (Something I will continue to strive towards!) ? Congrats on your growing family! Some of my earliest memories are at the Tulip Festival. We live not too far, but I wish we went every year! Loving this look, as always! So stunning! I LOVE those shoes! And you look so gorgeous in all-white with a red lip. I havn’t been to the Tulip Festival, but I live in the Sea-Tac area. I would really love to go! I have to admit I was super excited when I saw you were expecting #2, I’m 20 weeks today and starting to struggle with wardrobe. I always love your style and found myself looking back at your old outfits while you were pregnant with Isla (that sounds creepy, but I mean it in the most flattering way) Do you recommend any maternity jeans and/or a belly band? My skinnies are starting to become just a little too tight. This outfit is so clean and stylish. I love the colors and the style with the denim jacket. Very cool. Such a great look, as always! I am so excited for your clothing line, you have such incredible taste! Such a cute look! i love everything white on white.. I am so excited to see how you style your bump, round #2! congrats again girl! Stunning Rach! You look gorgeous! The tulip festival is on my bucket list. It must have been incredible to see. you look great in white! Such an effortlessly chic look and those shoes are so unique! I love your outfit, so classic but stylish! You are really making me want to buy those jeans hehe! I think it’s great that you show how you can style pieces in different ways. Love those shoes and that clutch! Absolutely LOVE the outfit! Perfect for summertime, what size did you get in the free people jacket? I tried it on in a medium and kind of liked the oversize look but never had the chance to try on a small. Yes! I live in Skagit Valley and took so many photos this year. They are even more beautiful in person! I love this entire look! 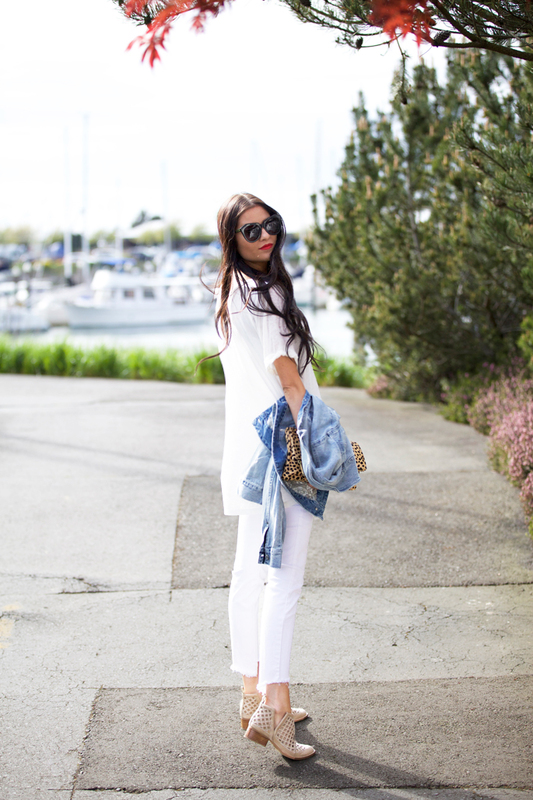 I’ve been drawn to the white-on-white outfit, and the denim jacket and leopard booties are the perfect accent pieces. I love these pants and those boots! 10 months in August. Do you have any tips on keeping them happy? This look, those boots <3 to die for! So excited about the launch of your new brand! I completed all three steps above! ? I followed all of the rules for entry! Can’t wait for the collection!